This week has been a great week for leftovers! We have been enjoying all kinds of reheated meals from Butternut Squash Mac ‘n Cheeze, to Tomato Barley Risotto, and some Holiday Soup For The Soul that I defrosted from the freezer. I don’t know why leftovers get such a bad rep…I’m always so happy when I realize that dinner is already cooked for me. I like to pretend that I have a personal chef when I eat leftovers. After making Butternut Squash Mac ‘n Cheeze this week, I had some leftover cheeze sauce to use up. I have been drizzling it on wraps and sandwiches and even dipping tortilla chips in it. It is quite a versatile little sauce! 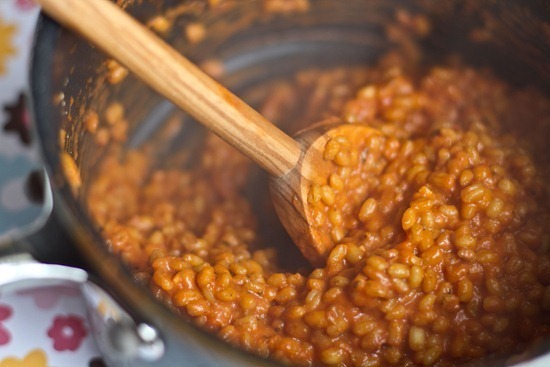 Then I decided to put a new spin on a favourite recipe of ours, Tomato Barley Risotto. I made a double batch this time, which is always great for leftovers. This dish reheats nicely and it is really fun to sprinkle on wraps or just reheat in a bowl with a splash of milk. But back to the sauce. 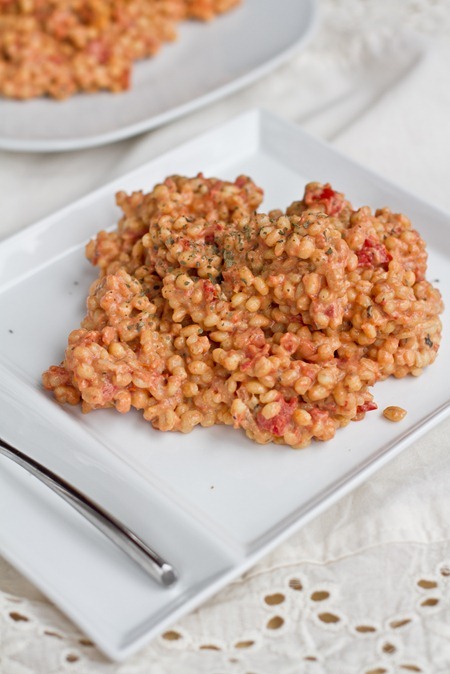 It was such a simple addition to the Tomato Barley Risotto, but the outcome was amazing. With just a bit of sauce stirred in, this dish was transformed! 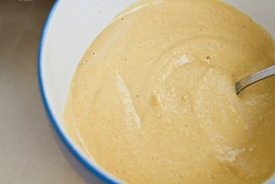 I mixed in about 1/2 cup of the cheeze sauce for a double batch (I didn’t really measure, but just added it to taste). It was mind-blowing good food. This dinner is going on a regular rotation for sure. I think it was the creamiest and most cheesy tasting vegan dish I have ever made (aside from the mac ‘n cheeze of course). I don’t show too many lunches on the blog, but this lunch was new and unusual so I thought I would share it with you. The star of the show was Fresh Dill! Do you guys ever cook with fresh dill? I have been in love with anything Dill flavoured ever since I was a kid (but mostly just Lays Dill Chips!). Growing up, I couldn’t get enough of those salty, deep-fried, crispy, tangy bites of processed crap. I needed an intervention. Fast forward to today, and while I love the idea of cramming a bunch of dill chips into my mouth, I’m not so keen on the idea of MSG or other mystery ingredients that lurk in these foods. I’ll take fresh dill any day. For some reason though, I don’t buy fresh dill very often (I guess I just don’t know what to use it in! ), but I really think I should. I originally planned on making Homemade Dill Chips (adapting the Salt & Vinegar Chip recipe), but I forgot to buy potatoes, so I decided the next best thing would be to make Dill Chip Chickpeas. They turned out wonderful. Eat your heart out Lays. Directions: Mix all ingredients to taste. Note: I tried roasting the chickpeas, but I preferred the flavour much more before roasting. Eat them on their own or sprinkle them onto salads or wraps for a fresh kick to any lunch. I roasted these, but I preferred the flavour before roasting, so next time I will just mix and serve! 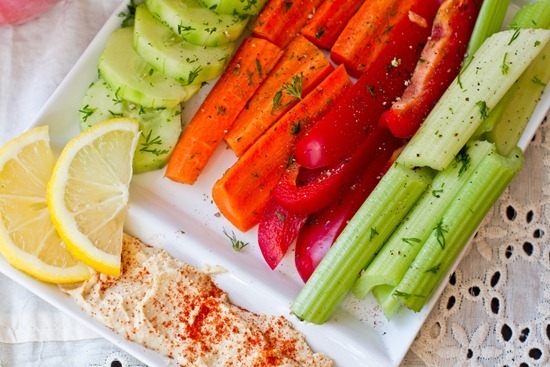 I enjoyed it with a rainbow of chopped veggies, sprinkled with dill and lemon, and served with hummus. It was such a great lunch and it really got me in the Spring mood. In home décor news, we finally have something on the walls I can show you. 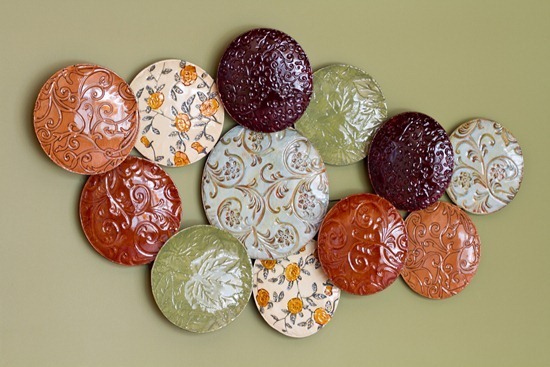 I picked up this plate-inspired wall décor on sale at Pier 1 last week. I thought it was perfect for the warm colours in our house. Eric said The Crazy Dish Lady now has dishes on the WALLS and he laughed at me. Today we are knee deep in taxes (personal and business), bill payments, and I also have a bunch of paperwork to complete. It’s one of those days when you wake up and you realize that you can’t put it off another day longer or two men will show up in dark suits and you’ll never be heard from again. On a happier note, don’t forget to Spring Forward tonight! Yawhoo!! I have some fun Spring-inspired recipes coming up this week to get you in the mood. i love that you have a collection of crazy lady dishes, angela! that is what i am aspiring to collect this year (a goal for 2011). i would like everything to be mismatched and to make me happy with either colour or “vibe.” just picked up a rather kitschy plate on vacation – but it will make me smile when i used it at home. i really like the wall art! good choice! I love dill too! 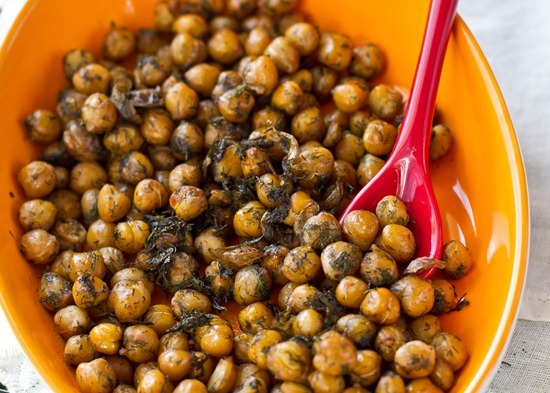 Oh my gosh… definitely making those dill chickpeas. First … that does look ultra creamy and ultra delicious!! Second … I love the new wall decor, it’s perfect! I love your new Pier One purchase ~ how appropriate! I love chickpeas and I love Lays Dill Pickle Chips, so I will definitely be trying this recipe! I love this — I have the exact same wall decor in our apartment! 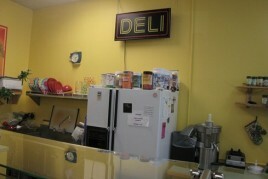 You have good taste :) In food and decor! I love dill too! I like to add fresh dill to green salads- it makes them so flavorful! me too! I added fresh dill to the salad I posted yesterday…it was fun! Wow, that risotto looks so creamy and delicious! I cannot wait to try it. I’ve had chickpeas on the brain lately too, and that hummus plate looks like a perfect lunch for a warm day like today (finally :) ) The wall decor is beautiful! I love how it harmonizes and accents at the same time. I love love love that plate decor! It’s so cute. I am all about left overs too. I eat left overs basically every day for lunch and love when I can recreate them into something even better the next time. The cheezy risotto sounds delicious! 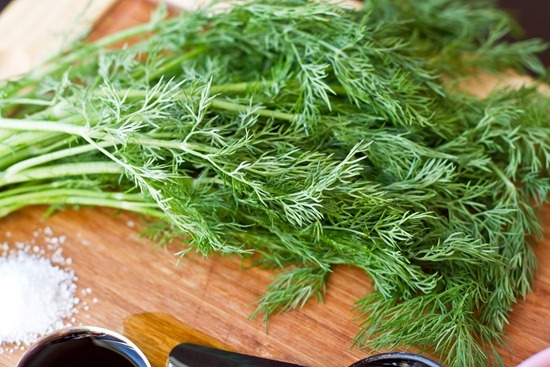 Have you ever thought of growing your own dill? You could even do it indoors in a window sill or something until the weather warms up. There’s nothing like fresh herbs growing in the kitchen and then actually being able to cook with them that makes you feel like you’re in touch with nature! I love the plates on the wall too! Taxes…yes, taxes. My hubby and I are still dealing with all the prep. work that goes into it, especially when you have you own business….so fun. Yes! I do want to grow my own herbs definitely. I have tried growing basil a few times and had NO luck at all, so I’m a bit apprehensive, but hopefully I can grow some this year! I seriously just dropped everything I was doing to make those Dill Chip Chickpeas. I.love.dill. I’ll have to try in in my salad soon. Two of my favorite recipes include dill: 101Cookbooks’ Carrot, Dill & White Bean Salad Recipe & Veganomicon’s Dill Basmati Rice with Chard and Chickpeas. SO DELICIOUS. mm thanks for the suggestions! I love that plate with the little place on the side for a fork or hummus! I love fresh dill can’t wait to start getting it in our csa box! 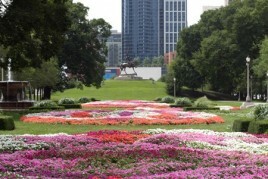 Im so excited for spring, bring on the recipes :) If only the weather would cooperate! I forgot about the clocks…oh darn. thanks for the great inspiration as always! I think leftovers get a bad rap because the texture is almost always different. I’m a huge texture person and I can’t stand leftovers becaue they are never as fresh or as crisp as when they were originally made. I love PIer 1 — I worked for them for 6 years – all through high school and college. Sometimes I wish I still worked for them! I love Pier 1, and that piece looks great against the wall color. Where do you buy your ceramic spoons? I can not seem to find them. 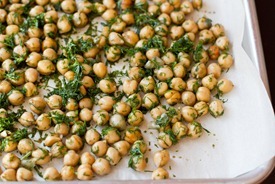 I am going to have to make the dill chickpeas, it looks so fresh and amazing! Thanks. Thank you for the quick response. I never thought to look at Crate & Barrel. Thank you so much for the info. Can’t wait to try these dill chips but I don’t have any dill in the house. It’s on my list. I loved those dill pickle chips!! Can’t wait to try your version. I LOVE your plates on the wall. It looks amazing. Those colors are great. I’m addicted to tomato barley risotto. 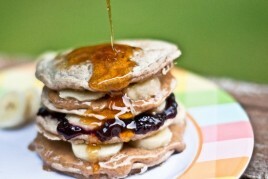 It’s so chewy and tasty and yum so will definitly try this. Made the creamy tomato risotto for lunch today, AMAZING! So good I didn’t want to stop eating it! 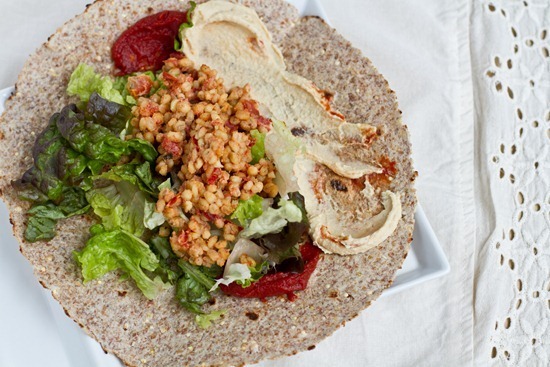 I’ve been stumbling upon a lot of chickpea recipes lately! Not complaining though…I love them! Yours look great. Fresh herbs are the best! I MUST try this cheesy dish….I am drooling over here just dreaming of it! 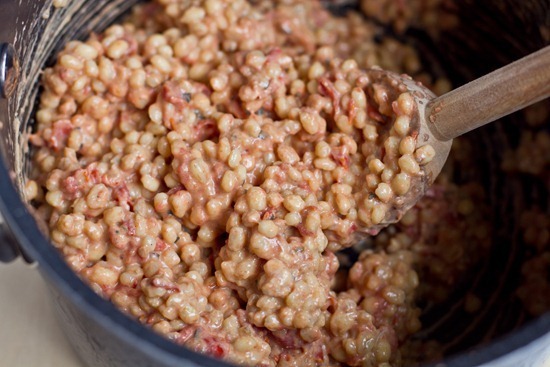 Oh wow, that barley risotto looks heavenly. Must try that asap! I will be making those chickpeas for lunch this afternoon, mark my words. Would dried dill work? Because that’s all I have. :) I wonder how much I would use? I don’t think the Dill flavour would be as strong, but its worth a shot! 2) I absolutely love roasted chickpeas and am definitely going to have to remember to try this dill recipe. Love those dishes you crazy dish lady :) I have an obsession with glass jars and containers :) You had me sold just looking at your picture of the rissoto but when I read down and saw those glorious dill chickpeas….Oh me oh my! Very good info, thank you! My mind immediately went to roasting them til i read that but I can see how actually roasting/carmelizing them may not be the best with the dill flavor. I bet they would be PERFECT in salads. I just made a raw zucchini pasta salad this week with chickpeas and homemade lemon, herb, and dill dressing. I love dill! SUCH a wonderful spring and summer-like flavor for me. LOVE the plates from Pier 1 too!!!!!! Love the plates! It seems very you! OMG, a friend of ours just bought the SAME plates from Pier 1 last week. And it looks great in BOTH places. Love “recycled” recipes. Yay for leftovers. Have a good weekend. Hi Angela! I am so happy to have found your blog! Last April, I became a vegetarian (well, mostly vegetarian – still eat fish occasionally). I love the way it makes me feel, but I have been running out of recipe ideas. I am an advocate of clean eating, but I find myself buying processed foods more than I should. Now that I’ve found your site, I won’t be doing that as much anymore! I love all of your recipe ideas! I can’t wait to try them! Thanks for the inspiration! And the dishes compliment the colors so well! They’re very fall-ey. Thanks for the cheezy sauce recipe, it sounds delicious!! And I love your wall decoration, I have never seen something like this but it’s stunning! And lastly I love your pictures – they look really professional! I made barley risotto this week too. stuffing it inside my omelet at lunch time. Do I spy a future vegan?!?! *cough* eric *cough* ;) Sounds like he’s really been enjoying the vegan food lately! I TOTALLY LOVE DILL! I put in the salmon burgers I make and I have even made dill humus (it’s delicious btw!)! 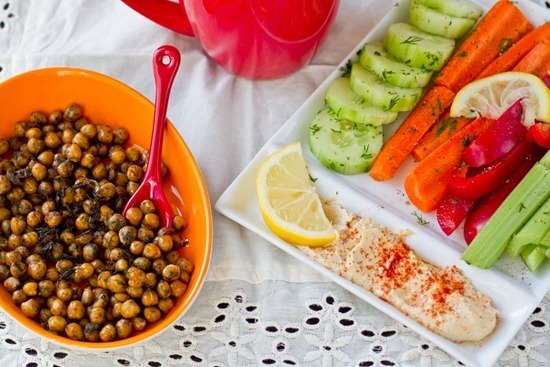 I love roasted chickpeas to so this will be perfect for me! Those dishes look great against the green paint colour! Great eye, Ange!! I was more of a salt and vinegar chip fan as a kid but I LOVE dill now and I often mix it into my tuna salads with some plain Greek yogurt, lemon juice, and black pepper. Normally I don’t buy a lot of fresh herbs because I can never use them up before they go off. 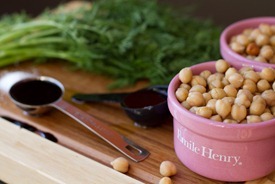 These chickpeas sound amazing though, so I think I’ll have to give them a try! I am in LOVE with fresh dill lately! I made a tahini-dill dressing the other day, and I was licking the spoon it was so good! It’s made me look forward to eating salads every day this week! Can’t wait to try that “cheesy” risotto– it looks insanely delicious. i LOVE using fresh dill – Try it in a vegetable soup, tomato based type works best and I use quite a bit in the recipe but go to your own taste. The chickpeas sound great, I cant wait to try them. Love those plates on the wall! So pretty! I love dill chickpeas! I made them a while ago, and they are divine! Yum, I loooove dill! 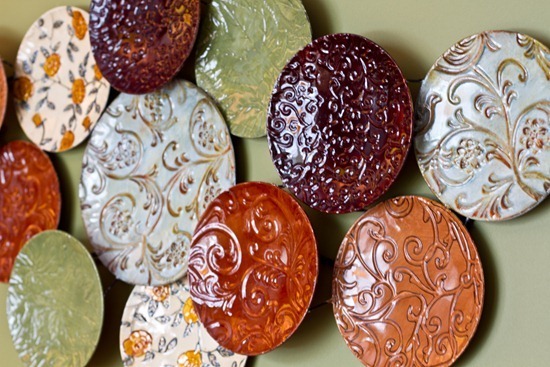 Those plates have the perfect colors and textures for that wall. I love it! Those chickpeas sound so good! It reminds me of something I’ve been making lately–dill hummus! I just throw some dried dill into the mix along with the other ingredients (lemon, garlic, tahini, pepper, cayenne, chickpeas, onion powder, etc.). It’s a really fun way to mix up the hummus routine. I also love cumin hummus. I have lemon dill hummus on my list this week! Love these dishes! Been lovin Dill lately too. Will you cook and decorate for me…please!! Those dilly chickpeas look great! I am a huge fan of roasted chickpeas.. I love your plates too. My aunt has the same dishes! Did you get them at Pier 1? I am addicted to that store. zomg. I make baked chickpeas just like this but I use lemon juice in place of the balsamic. I was planning to make a batch of baked chicks tomorrow… I sense dill in my future! Yup the blue bowl, orange bowl and white plate are from pier 1. :) Loooooove their dishes. Great vegan recipes. Hope tax stuff goes well. I am doing my taxes this weekend too. I procrastinated last week and weekend. I decided to do them this weekend because I know if I procrastinated this weekend I would keep putting it off and I just want them to be done and mailed so I do not have to worry about them or be crunched for time. When you mention that you used the leftover cheese sauce, is this pre or post adding the butternut squash for the mac and cheese? I never cook with fresh dill, but those dill chip chickpeas are so amazing. I definitely have to try this. And, the dishes on the wall look very nice of course. Thanks. I love the new dish artwork! I have started seeing a nutritionist who is introducing me to an whole new world of food! It is really exciting…and I already feel better! I could honestly spend the day over here checking out EVERYTHING! So glad you are living LIFE with such PASSION! You are a tremendous resource! 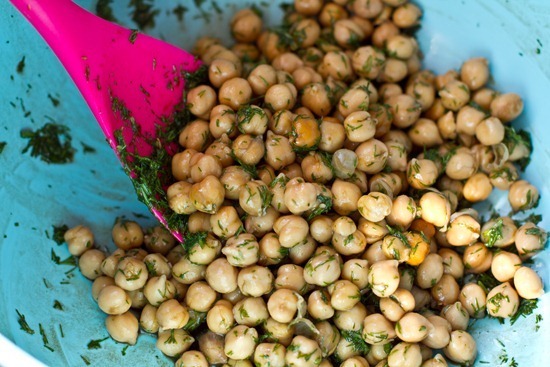 I NEED to make these chickpeas…yum! I don’t use dill very often but I added it (dry) to our pasta last night and my husband went nut for it, I have to remember to use it more often! I just planted a bunch from seed so hopefully I will soon be overwhelmed with it and will be making these chickpeas all summer! I LOVE dill but I always forget about it for some reason. Those chickpeas look tasty! 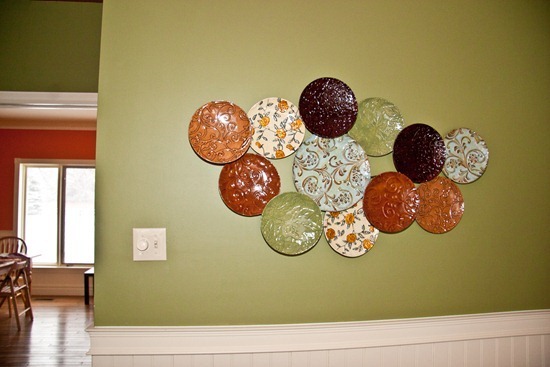 And love your plate wall display! So adorable, what a great idea! I made the chocolate cupcakes that you posted a couple days ago. I modified them a teensy bit but everyone (even the picky family) liked them! Vegan-ified success! 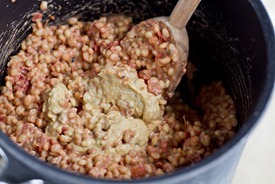 I had a go at the barley risotto last night and it was delicious!! I used fresh tomatos as well as tinned, and threw in a bunch of spinach as well and it was utterly delectable! My meat-loving partner thought it was awesome and we both really enjoyed the texture of the barley. Such a nice change form rice, which I am not a huge fan of anyway. Thanks heaps for the recipe, glad it caught my eye this time :) I think it will definitely be a staple in my house from now on! Update: A little BBQ seasoning is fantastic on crispy chickpeas! 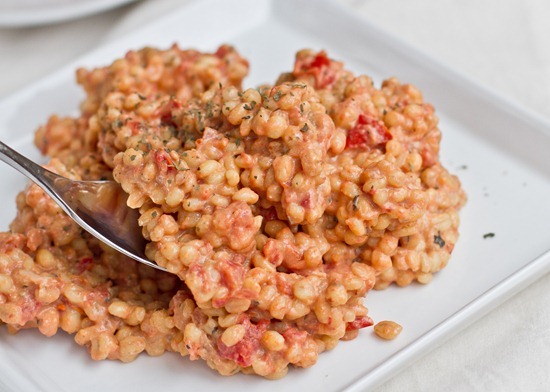 We had your Tomato Barley Risotto tonight and OMGoodness! It is so good. Everyone ate it all up. Next time I will have to try it with some cheeze sauce. Dill and Cilantro are my favorite herbs, personally I can’t think of much that they won’t be good on. Can’t wait to try the dill chip chickpeas! Love the plates on the wall!! Love chickpeas too. Have you heard of “The Indian Slow Cooker” by Anupy Singla?? She takes DRIED beans, unsoaked, and uses the slow cooker to make amazing Indian food. It is so simple & so dirt cheap. Nearly the entire book is vegan and she has lots of yummy black chickpea, and regular chickpea recipes. I have blogged many of our results with the recipes. Thanks, Angela! I made the risotto last night and it was a big hit! I accidentally bought wheat berries instead of barley (I live in South America, so sometimes I forget to look up the spanish name for what I’m buying! ), but it still turned out nice and chewy. Right before all the broth absorbed, I added two big handfuls of spinach and let it cook into the risotto … delicious! Chickpeas and dill is delish! I have to say I love the dishes on the wall but honestly there’s not enough of them. Imagine the impact of the whole was was covered with crazy lady dishes. Now that would be a work of art and this is coming from a professional artist.